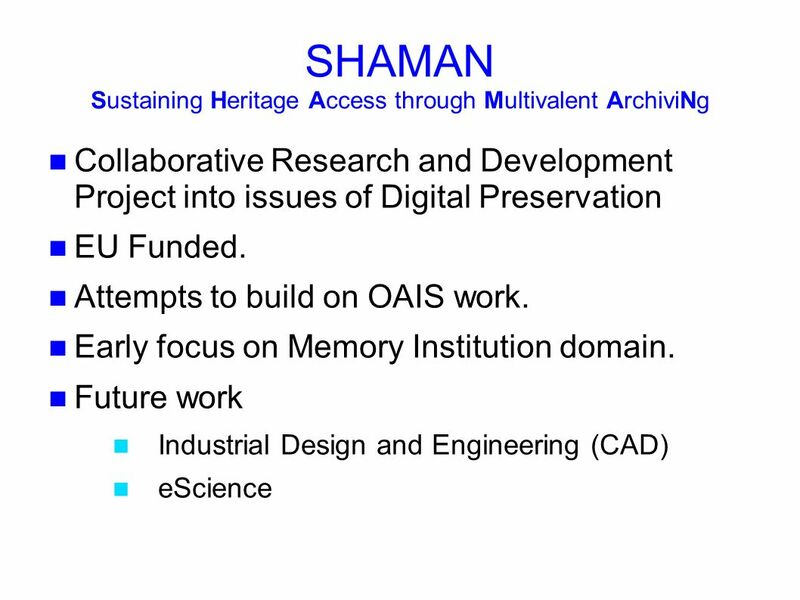 4 SHAMAN Theory of Preservation In order for data to be of use to future generations, we also need to preserve means of understanding an re-using data. Context Method of discovery within large-scale data sets Method of access and interaction Ideally all this should be achieved in a sustainable, infrastructure independent manner. 5 Sustainability and Infrastructure Independence Use Open Standards to describe: Structure of digital objects Metadata Data management policies and processes Preserve all this in the system, to enable migration of system to future technology. 7 Access (I) - Discovery As quantity of data increases, mechanisms for identifying useful items within collections become more important. 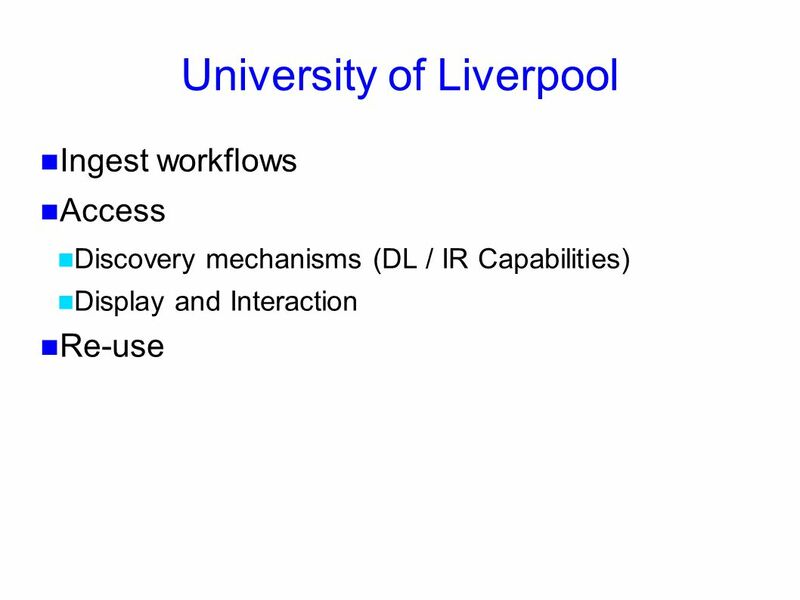 Support for resource discovery (digital library capabilities) within a collection directly within our data-grid storage infrastructure (iRODS). Future work to federate search across collections within a digital archive. 8 Access (II) – Display and Interaction Multivalent Render diverse file formats directly from original bitstream independent of native software. Platform for development of new and unforeseen capabilities for interacting with obejects across the diverse formats. Enables annotations to promote discovery and re-use. 9 Bringing it together Integrated Sub-Project (ISPs) develop proof-of- concept prototype software systems. Prototype digital archive bringing together ingest and access capabilities. 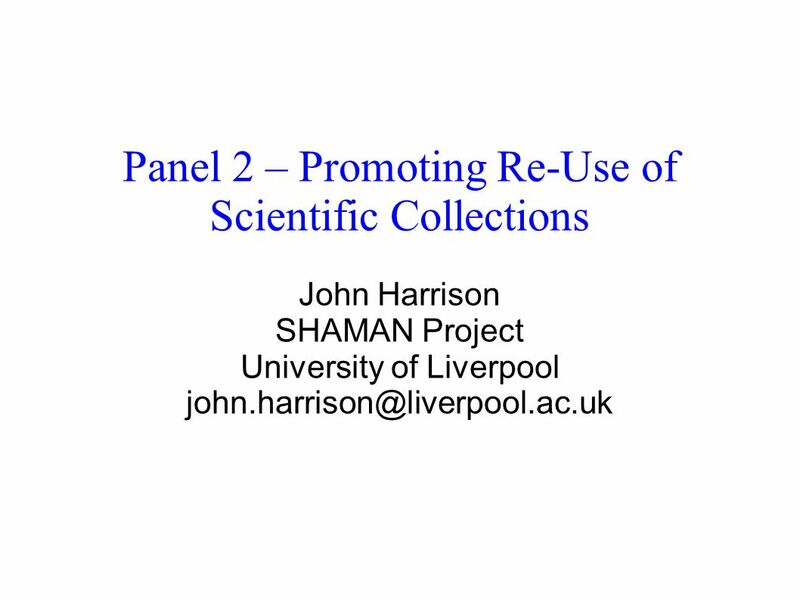 Download ppt "Panel 2 – Promoting Re-Use of Scientific Collections John Harrison SHAMAN Project University of Liverpool"
Texas Digital Library Services Preservation Network. A Community Approach to Preservation: Experiences with Social Science Data ASIST Summit 2010 Jonathan Crabtree April 9, 2010. A centre of expertise in data curation and preservation DCC/NeSC eScience Workshop, June 2008 Working in partnership with the eScience community This work. 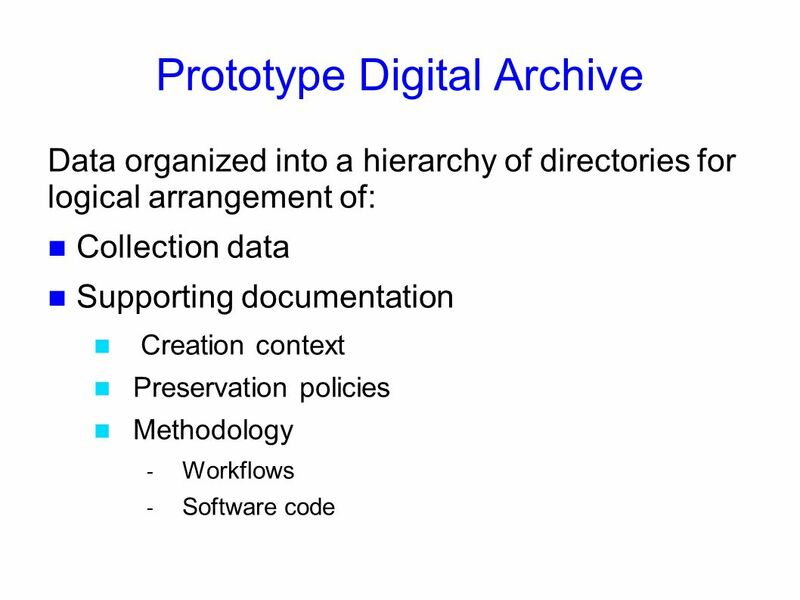 Digital Preservation: Logical and bit-stream preservation using Plato and Eprints Introduction: Digital Preservation Recap Hannes Kulovits Andreas Rauber. A centre of expertise in data curation and preservation DCC Workshop: Curating sApril 24 – 25, 2006 Funded by: This work is licensed under the Creative. Pulling it all together… with thanks to Sheila Anderson. Introduction to Research Data Management Services, January 2013 Library Data Services Functions and activities. QA Focus Digital Preservation End of Programme Meeting: 5/99, 7/99, DiVLE and JISC/NSF International Digital Libraries. INFSO-RI Enabling Grids for E-sciencE Grid & Data Preservation Boon Low System Development, EGEE Training National. Sustainable Preservation Services for Archivists through Distributed Custody Caryn Wojcik State of Michigan Records Management Services. 1 Software & Grid Middleware for Tier 2 Centers Rob Gardner Indiana University DOE/NSF Review of U.S. ATLAS and CMS Computing Projects Brookhaven National.